Although photographing a wedding usually conjures the image of primarily working in a handheld fashion, there are often moments in the course of events that can truly benefit from the use of additional camera support by using a tripod. When it's possible to plan your shots in advance, a tripod will add increased stability to ensure sharper imagery and greater control and refinement possibilities for your compositions. Handheld shooting will often be your main method, but a tripod is an ideal accessory for accomplishing a wider array of imagery that might not be possible otherwise. For our list of 10 recommended full-size tripods and our list of 12 recommended travel tripods, check out those links. Keep reading if you want to evaluate specific tripod features that are wedding-photography friendly. "If you're photographing indoors, without flash lighting, a tripod is a necessity—simply due to the certainty of long exposures." Since weddings vary drastically in terms of their physical environs and the number of guests or photos required, the tools you need to successfully capture a wedding can also change drastically from client to client. A tripod can play an important part in lending an extra hand in efficiency in a number of ways. Dim or difficult lighting conditions are fairly common at weddings, and longer exposures are often required to compensate and provide sufficient illumination and depth of field. If you're photographing indoors, without flash lighting, a tripod is a necessity—simply due to the certainty of long exposures. Tripods can also be essential if you're photographing with multiple cameras in a remote setup. By positioning cameras around the scene at particular angles, you can free yourself up to be working handheld or free an assistant to be moving as well. A simple tripod setup with a background can expedite the making of formal portraits of guests and members of the wedding party, since the bulk of the compositional work will always be stationary. Lastly, for creative close-up shooting and unique images of the preparations for the wedding, the rings or other adornments at the ceremony and reception, a tripod will ensure sharp photos regardless of the amount of light available. At a wedding especially, sharp still imagery is essential to making your clients happy with the document of their wedding day. Considering the number of tripod and support options available, it can be very overwhelming due to the sheer number of choices in almost every tripod and peripheral components. Here are some basic ideas that will help you navigate the general makeup of a tripod and how to select the proper parts to make up a support system best suited for you. The legs of a tripod are one of the two most essential components of a fully functional tripod system, and serve as the point of contact between your camera and the ground. Legs come in a plethora of shapes, sizes, construction types, weights and so on. The basic idea, however, is that you are looking for the optimal combination of stability, weight, load capacity and size. The first category of tripod legs is determined by the material from which they are constructed. The two main types are aluminum alloy and carbon fiber, with less common options being wood or an array of other metal combinations. For the more common options available, carbon fiber and aluminum, the main difference lies in their weight. Carbon fiber tripods are the lighter-weight option for the same size tripod, while providing the same, if not greater, load capacity than aluminum legs. The next consideration will typically concern the dimensions of a tripod, including its folded length and its maximum height. With a tripod extended so you are working at eye level, naturally you will want to find a tripod with a maximum height that is as tall as or taller than you are. The folded length of a tripod affects its portability and how short it will be when fully collapsed. This length is determined by a number of variables, the main two being the maximum height of the tripod and the number of leg sections integrated into the tripod’s design. Extra leg sections typically means a tripod can be extended more, and its minimum and folded lengths are shorter than a three-section leg—which is ideal for shooting from low angles and closer to the ground—whereas a tripod with fewer sections will typically be more stable and support greater load capacities. The load capacity of a tripod, or support weight, is the maximum recommended weight a tripod can hold while still providing necessary stability under normal conditions. Even though the combined weight of many DSLR and lens setups is far lower than the maximum weight capacity of most tripods, a tripod with a greater weight capacity will provide better stability when working in windy conditions or on unstable or uneven ground. It is best to select a tripod with a weight capacity in excess of your shooting setup, to offer guaranteed stability if you're working with additional accessories such as microphones, lighting equipment and so on. Many tripods include optional or retractable spiked feet in order to give more anchored traction if working on softer ground. For shooting in general conditions, rubber feet are usually the most viable option due to the traction they provide, and their compatibility with both hard and soft surfaces. One of the last things to consider when looking for a tripod system is the type of center column offered, and the range of features and movements it can provide. Many tripods have center columns that can provide quicker height adjustment and can also tilt to provide expanded options for the angle from which you are shooting. Center columns typically are configured in either a geared or rapid fashion. A rapid center column has a locking screw that, when loosened, enables you to position the height of the column yourself, without preset increments. A geared column incorporates a crank system, with notches on the column that engage with the crank, which provides a steadier and secure method of raising and lowering the column by rotating the handle. Both column types have their benefits and drawbacks: a rapid column can be adjusted more quickly, but can also be more unwieldy when loosening it with weight on the tripod head. A geared column is more secure since it uses the crank system to hold it in place when extended, but is slower to adjust to the desired height. Furthermore, many center columns also have additional functionality to work upside down in order to provide extended low-angle shooting possibilities. In addition to different center column types, there are also a couple of tripod leg lock types that operate differently, but essentially perform the same task. Leg locks are the mechanisms used to tighten leg sections and enable them to telescope in order to change the working height of the tripod. Some of the main varieties of lock types are twist-lock type, where each section has a threaded lock roughly the same width as the leg to allow loosening or tightening. This style is more streamlined since it resides within the legs’ actual form, but can be slower to manipulate since it requires two hands to loosen and fasten the locks. The other most common type of leg lock is the flip-lock, which is a locking lever at each leg section. When flipped open, the legs can extend or retract, and when closed down they will stay in place. This style of locking mechanism is a bit faster to operate since it can be opened or closed with one hand, but it does protrude from the tripod’s inherent form and can be prone to snagging cords or straps. The second main component to a tripod system is the head, which attaches to the top of the tripod legs and serves as the connection and control point between your camera and the lower portion of the tripod. Tripod heads provide a stable surface on which the camera can rest, and feature a range of controls for positioning the camera at a variety of angles and directions. Like tripod legs, ball heads have a maximum load capacity that should be paired to best suit the weight of your camera and any additional equipment you will have mounted on it. This weight capacity should be paired to both the camera itself as well as the legs; the total weight capacity will be dependent on the lower capacity of the two. If your legs support 20 lb and your head only supports 5 lb, then you can successfully stabilize a 5-lb setup. Likewise, a head with a 20-lb capacity that is used on legs with a 5-lb capacity will still only perform optimally with loads of 5 lb or less. While there is a great array of head types, the two main variants are ball heads and pan and tilt heads. Ball heads integrate a rotating ball base to give a great range of directional control and placement options. Since there are no confined axes on which to position the camera, you can quickly place the camera in any direction simply by loosening the lever or thumbscrew, pointing the camera in the desired direction and then retightening. Ball heads do have their constraints, though, and will specify the number of degrees in which they can be manipulated. Additionally, ball heads often feature separate panning controls for independent lateral movements. A more constrained head design that operates along dedicated axes is a pan and tilt head. Such a head has separate handles that must be loosened in order to dictate the amount of front/back tilt, side tilt and lateral rotation. In effect, both ball heads and pan and tilt heads can typically position a camera in the same manner as the other, but will do so in a different fashion. A ball head is typically quicker to operate, but less precise. A pan and tilt head will be slower to drastically alter the position, but provides more control since only one axis can be changed at a time. In addition to these two head styles, some of the other popular options are geared heads, pistol grip heads and gimbal heads. A geared head is similar to a pan and tilt head, in that it operates along specific planes, but does so in an even more controlled fashion by way of a geared system. This enables you to dial-in precise measurements for the greatest control and exacting camera placement. A pistol grip head utilizes a similar design to a ball head, but provides a means for setting camera placement in an even faster, and one-handed, method. These heads incorporate a grip with a locking button which, when squeezed, allows you to modify the angle of the camera on the tripod. When released, the camera will be locked in position for shooting. Finally, a gimbal head is a specialized design that is best suited for use with long, telephoto lenses. A gimbal head’s design aligns the lens and camera’s center of gravity along the tilting axis to render the entire camera system nearly weightless. This provides the ability to quickly track moving subjects when working with heavier and longer lenses. In addition to simply selecting a head design that is suitable to your working style, a few other considerations should be made when selecting a head. For attaching the head to the tripod legs, there are two standard thread sizes, 3/8”-16 and 1/4”-20, that need to be compatible with one another in order to properly mount the head to the legs. The second, and more important, compatibility issue to look for is the type of quick release system (if applicable) that the head uses. In order to attach a camera to a tripod head, a quick release plate, which is attached to the bottom of the camera via its threaded tripod socket, is typically used. These plates come in an array of shapes and sizes and are matched to specific heads and brands. 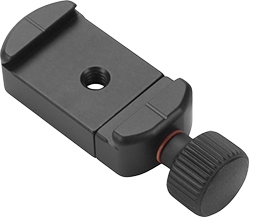 They quickly click into and out of the tripod head to provide fast mounting and removal without having to rotate the connecting screw on the tripod. While these plate designs are often proprietary, depending on the type of head being used, there is one standard that many brands utilize for greater compatibility between brands of both plate and head manufacturers. This style, called Arca-type compatible, features a 45° dovetail design and a 38mm plate width, which provide a good balance between support, security and efficiency for removing and installing cameras on tripod heads. This standard is not always completely constant from brand to brand, however, but refers more to the dovetail design and its ability to provide a secure system of mounting. Since a tripod is an additional and larger-shaped piece of equipment to be carried while working, there are a number of dedicated accessories that can be utilized to help make transport easier. Tripod straps are, just as the name suggests, a specific strap design that attaches to the tripod for carrying over the shoulder while still allowing full access for utilizing the tripod. A strap is an ideal tool if you're working with a large amount of gear, but still want somewhat quick access to everything to expedite setup and breakdown times. Also assisting the simple task of carrying a tripod, leg wraps and protectors are specially designed sleeves that add a layer of padding to the legs for more comfort when they're slung over your shoulder. When used in conjunction with aluminum tripods, they also serve as a comfortable barrier between your hands and the conductive metal legs in hot or cold conditions. Once you've finished a day's work, a dedicated tripod bag is also a useful carry accessory to transport your tripod back to home base. For more information about tripods and how they can be extremely useful to wedding photographers, please speak with a B&H sales professional in our New York SuperStore, over the phone at 1-800-606-6969 or online via Live Chat. If you have specific questions or comments, or need to know more, please type away in the appropriate box, below. We love hearing from our readers! Tripods are great when you can use them, but they can be heavy, bulky and a tripping hazard, so it pays to know your location and be mindful. A good compromise is a monopod, especially the type with a small tripod built into the base. You see them used for video production, but they work great for stills, too. Not as stable as a tripod but lighter, easier to carry, less in the way and quicker to change position. Val V. on Which Video Camera is Best for You?